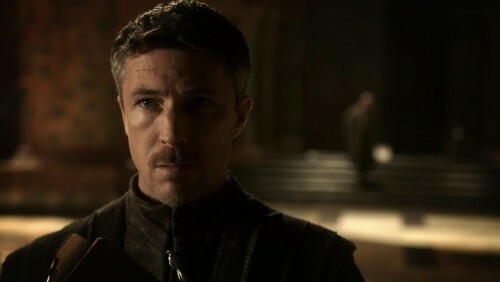 A short, slender man, Lord Petyr Baelish has had the byname of Littlefinger since he was a child, when he was fostered by Lord Tully in Riverrun and became acquainted with his son and daughters. At one time, Littlefinger developed a passion for Catelyn Tully, and even challenged her betrothed Brandon Stark for her hand in marriage. The duel ended badly, and Littlefinger nearly died. He was sent away from Riverrun in disgrace, and returned home to the Fingers in the Vale of Arryn, where his father was the smallest of small lords. His cleverness and connection to Catelyn’s sister, Lysa Tully, helped lead him up from such low beginnings. He proved exceptionally capable at collecting taxes and helping to finance Lord Arryn’s desires, so much so that he was brought to King’s Landing to do the same. Within three years, he had become master of coin—the king’s treasurer—and joined the small council. He has held this office for some ten years. Littlefinger is everyone’s friend, quick with a witticism. A courtier through and through, he’s always fashionable and never, ever caught out. Aidan Gillen is certainly rather taller than Littlefinger is described to be,being 5’10” whereas Littlefinger was probably nearer 5’4” to 5’6”. The actor is also approximately 10 years older than the character, part of the general aging up of not only the children but the adult characters as well.